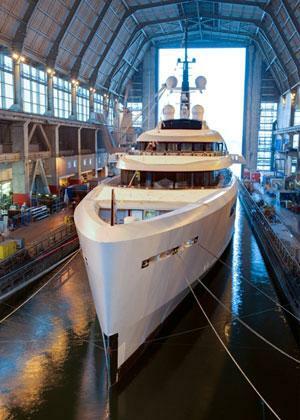 On Saturday 10th September 2011 the spectacular new 96 metre motor yacht from Devonport Yachts was christened, making it the largest private motor yacht ever built in the UK. The former Project 55, now Vava II, was styled by Redman Whiteley Dixon with interiors by designer Remi Tessier. Sea trials will commence in October 2011 with the yacht being delivered soon after. The impressive Vava II is built to SOLAS-36 passenger ship standards.